Freedom to Live: The Robert Hartman Story 1. What am I here for in the world? 2. Why do I work for this organization? 3. What can this organization do to help me fulfill my meaning in the world? 4. How can I help this organization help me fulfill my meaning in the world? In the course of answering these questions we are taken on a personal exploration of the systemic, extrinsic, and intrinsic dimensions of value as they apply to our individual lives. The purpose of this exercise is to help each of us in our search for meaning and in our endeavor to prioritize our values as we make decisions. Dr. Hartman also explores our spiritual nature by applying his thinking to the intrinsic realm in religion. Robert Hartman's vision was to give us the means to recognize and fulfill "the good" within each of us, thereby enriching our lives. By applying these principles on a broader scale, we may also enrich our world and make it a place of more "goodness" and peace. When the light of formal axiology is cast upon our world, the elements involved in making particular decisions are revealed with a kind of value clarity previously unknown. 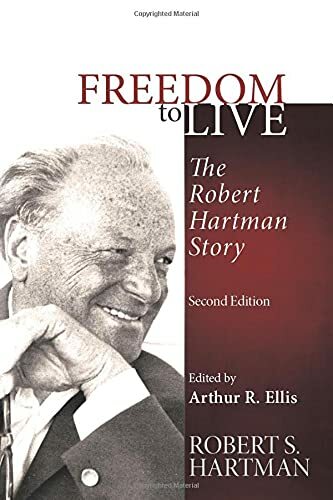 This Second Edition of Freedom to Live: The Robert Hartman Story includes many minor editorial improvements, a new and much expanded table of Contents, a much more detailed Index, and new photographs. Many thanks to Stacey McNutt for the new photos she contributed to this Second Edition-Numbers 1, 5, 6, and 11. Many thanks also to Rodopi, Amsterdam - New York, its original publisher, for returning the rights to this book to the Robert S. Hartman Institute. Robert S. Hartman (d. 1973), Research Professor of Philosophy at the University of Tennessee and the National University of Mexico. His lifelong quest was to answer the question, "What is good"-and to answer the question in such a way that good could be organized to help preserve and enhance the value of human life. He believed that he had found this answer in the axiom upon which he based his science of axiology: "A thing is good when it fulfills its concept" Arthur R. Ellis, PhD, is a Licensed Professional Counselor who has been a clinician since 1971. He holds degrees in psychology and rehabilitation counseling from the University of Tennessee, Knoxville, and a doctorate from Lasalle University. In recent years he has worked as a therapist in the Psychology Service of a Veterans Administration Medical Center. He studied axiology under Robert S. Hartman, who personally trained him in the use and interpretation of the "Hartman Value Profile" (HVP). Over the years he has administered and interpreted hundreds of HVPs. His research has included explorations of the value patterns of alcoholics. He has been active in the R. S. Hartman Institute for Formal and Applied Axiology, serving on the board of directors and holding the positions of executive director and president. He is a certified Master Addictions Therapist and a Diplomate of the American Psychotherapy Association.